Delta News & Review: Bay Delta Plan: Weird Science? Bay Delta Plan: Weird Science? In 2009, a reporter for CBS’s 60 Minutes asked the then-Governor Arnold Schwarzenegger a hard question about California’s water. 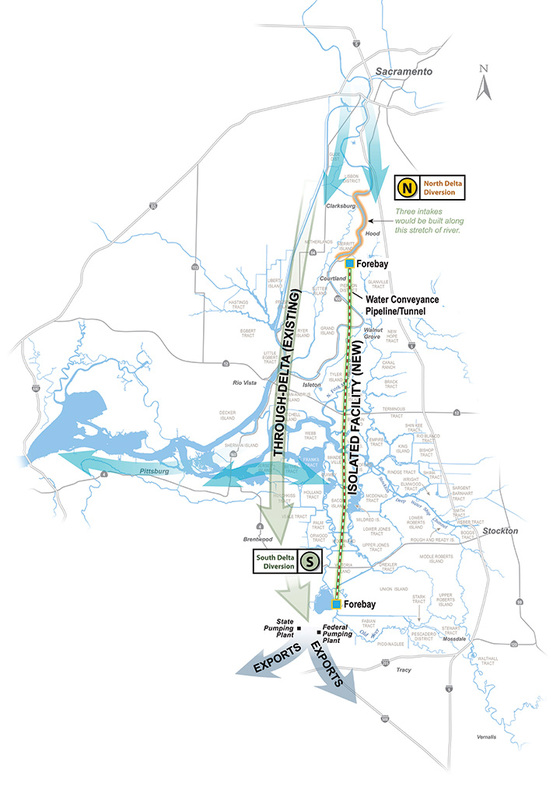 The state had been battling over the fate of the Sacramento-San Joaquin Bay Delta for decades, and, with the Governator’s encouragement, work was progressing on the new Bay Delta Conservation Plan. The plan was supposed to supply water to Central Valley farms and Southern California cities while also protecting Delta fish and farmers. It was a tall order, and 60 Minutes wanted to know if Schwarzenegger thought he could have it all. Four years later, things in the Delta are still complicated—so complicated, in fact, that current governor Jerry Brown is among those sick of the “analysis paralysis” that accompanies trying to make everyone happy and is moving forward with the centerpiece of the 50-year Bay Delta Conservation Plan: a pair of multi-billion dollar tunnels beneath the Delta that will (hopefully) help recover imperiled fish like the delta smelt and Chinook salmon, while reliably moving water south. With so many interests at stake, it’s not surprising that lawmakers are already criticizing of a draft version of the first four chapters of the Plan, released last week, for putting “the interests of south-of-delta water contractors before our farmers, fishers and small business owners who depend on the delta for their liveliehoods,”as Rep. Mike Thompson told E&E News (subscription required). But there is also wide recognition that something must be done in the Delta, as Emily Green reported for HCN, after Brown first unveiled the most recent tunnel proposal last summer. The entire ecosystem is in peril, and the year-to-year pendulum between holding back water for fish and sending water away from the Delta makes both people and fish insecure. However, it’s important to note that while the Bay Delta Conservation Plan has wide-reaching implications, it’s not a comprehensive planning document for the region--it's a way for state and federal projects that export water from the Delta to comply with the Endangered Species Act. If you want to know more about balancing water use in California, look at the State Water Board, reports KQED. The draft chapters of the Plan outline current ecological conditions in the Delta and set conservation goals, including 100,000 acres of Delta habitat restoration that Chuck Bonham of California’s Department of Fish and Wildlife said could be observable from space (if the public pays for it, that is). 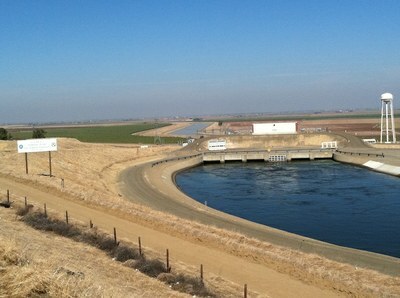 A 2011 National Academy of Sciences report argued that a preliminary draft of the Plan was “incomplete and contains critical scientific gaps.” Some of the specific concerns were lack of coordinated management in the plan, lack of clear management goals and lack of clarity about the volume of water to be diverted through the new tunnels. I was curious to learn if the new draft chapters address those concerns. I called up Sam Luoma, a UC Davis professor and former lead scientist for a major Bay-Delta science program, CALFED. Luoma was also a panelist on the 2011 National Academy report. While it’s still early to fully assess the progress made since 2011, Luoma combed through the documents released last week and offered up his perspective from his first reading of the new draft. First, the planners have done a lot of work since 2011, he said. However, he’s still concerned about the Plan’s ability to cope with, in his opinion, the largest scientific uncertainty contained within: how much water can be exported from the Bay Delta without losing what Luoma calls “some of our iconic fish” like salmon or Delta smelt. “We don’t know the answer in acre feet of water at all,” he says, and it’s not for lack of trying. The antidote to that uncertainty, and a major scientific lynchpin of the Plan, is a learn-as-you-go approach to management, called adaptive management. “You do it, and then you have to figure out how the environment is being affected by what you do,” he said. Even though adaptive management is the right answer in this situation, the details of that second part, monitoring the environment after you change it, are where Luoma is concerned things could fall apart. That’s because the monitoring plan contains a 12-page list of actions, everything from checking on giant garter snakes as a marsh habitat indicator, to tabulating the percent cover of noxious weeds. It’s an impractical number of things to track effectively, and basically a grocery list of disjointed actions, not a cohesive strategy, said Luoma. The consequence is that it will be hard to tell how fish species and ecosystem health are affected by the actions outlined in the plan—which are substantial. Basically, if the new tunnels go in, it will be like running a giant experiment on the Bay-Delta. With so much on the line, it’s worth running as well as possible. But ultimately, said Luoma, policy decisions cannot be made by science; there’s too much uncertainty. “Science cannot tell is whether or not to build (the proposed tunnels),” he said.